This completes the most thorough history of the campaign to date. Volume III is a mixed bag, wrapping up the first two volumes and providing meat and potatoes statistics and research tidbits that all footnote readers will enjoy. The narrative portion of the book picks up on the morning of September 21, with both armies dealing with the immediate effects of defeat and victory. Three chapters follow both armies to the environs of Chattanooga. 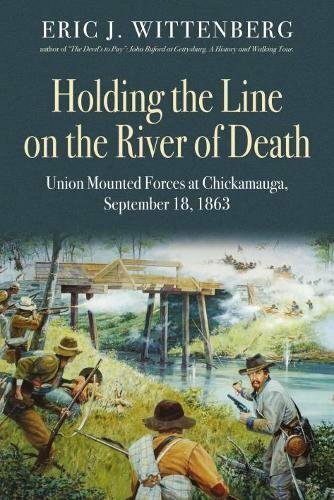 Two chapters discuss the costs and consequences of the campaign, and appendices deal with rear guard cavalry action in The Last Clash at Chickamauga and the relationship between William Rosecrans, James Garfield, and Charles Dana. Then the fun begins. In a manner reminiscent of Joseph L. Harsh’s wonderful Sounding the Shallows, Powell offers the reader insight into both the numbers of the thing and the researching and writing process itself. Five appendices include: Union Order of Battle; Union Losses; Confederate Strength with Sources and Methodology (arranged in Order of Battle format); Confederate Losses (Powell provides the most detailed and complete look at Confederate numbers and losses to be found); and a Return for Polk’s Corps for October 22, 1863. These are followed by a magnificent 85 page (!) bibliography. Powell’s extensive use of newspaper accounts from all points of the compass is impressively displayed. The different contemporary newspapers from which he drew number approximately 150! The whole book is complimented with bottom of the page, detailed footnotes (with the exception of the Union OOB through Confederate Losses appendices which employ end-notes for purposes of style). This is a great capstone to Powell’s take on the Chickamauga campaign (and let’s not forget his Campaign Atlas and his iconoclastic look at Confederate cavalry during this time, Failure in the Saddle). Don’t miss it. A) Get Volume I (The Chickamauga Campaign – A Mad Irregular Battle: From the Crossing of the Tennessee River Through the Second Day, August 22 – September 19, 1863, which has been out since last year. 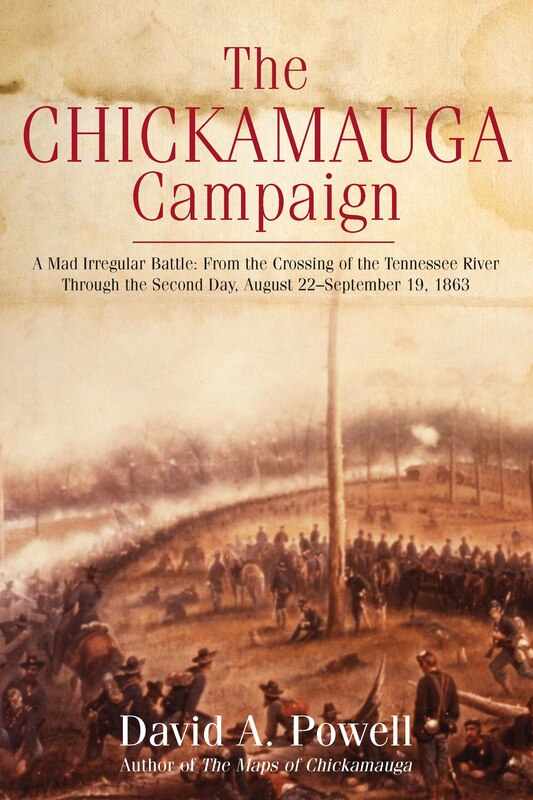 B) Get The Maps of Chickamauga: An Atlas of the Chickamauga Campaign, Including the Tullahoma Operations, June 22 – September 23, 1863, which has been out for, like, six years so you have no excuse. C) Read them together, stopping in the map book when Volume I ends. I read the Atlas map section first, then the corresponding detailed narrative. D) Then get the newly released The Chickamauga Campaign – Glory or the Grave: The Breakthrough, the Union Collapse, and the Defense of Horseshoe Ridge, September 20, 1863. E) Repeat C) above through to the end of Volume II. F) Sit and wait for Volume III. What is covered in Vol. II is apparent from the title. You get 708 (!) pages of narrative. Yes, just in Vol. II – Vol. I weighs in at 641 pp. Footnotes are at the bottom of each page. Plenty of maps (but you’ll still want to keep the Atlas nearby) and illustrations throughout. The OOB is in Vol. I. The bibliography will be in Vol. III. So, you see, you’ll need to buy all four books. Are there problems? Some little, nitpicky ones that aren’t really worth mentioning and probably only bothersome to people like me who are more directionally challenged in their reading, and perhaps rely on maps a bit too much. And the weird misplaced word or punctuation that is omnipresent in publishing these days. Nothing to worry about – I think we just have to get used to that stuff. 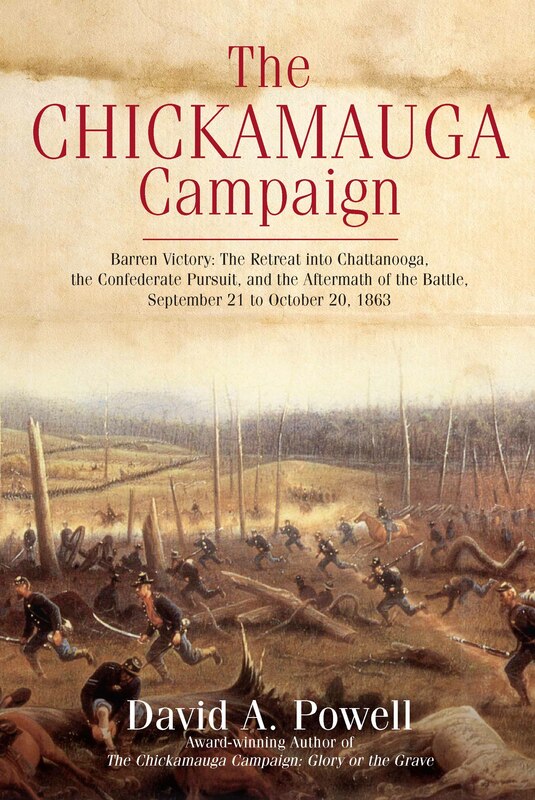 This is the Chickamauga Campaign study. You need to read this. I’m finishing up Vol. I now (I had to take a break for some fiction – Andy Weir’s The Martian was fun, by the way – as my brain gets fried after 450 pages of anything.) I’ll be cracking Vol. II next, and I’m really looking forward to it. The fist of David A. Powell’s proposed three volume study of the Chickamauga Campaign, A Mad Irregular Battle: From the Crossing of the Tennessee River Through the Second Day, August 22 – September 19, 1863, is now available from publisher Savas-Beatie. Even though Dave is a friend (about 10 years or so ago I spent a few of wonderful days on the Chickamauga fields with him as part of a very small group of about four or five, and have interviewed him here), I firmly believe that, unless something goes horribly wrong, when complete this will be the most important work on the campaign to date. The skinny on Volume I: 631 pages of narrative (and yes, there are two more volumes!) with foot – not end – notes. There’s no bibliography in this volume – it will be included in Volume II. I imagine it will comprise a good chunk of that volume: Dave’s newspaper sources alone are extensive. Despite the title, this installment covers most of the summer of 1863, beginning with the Tullahoma Campaign June 24 to July 4, to the crossing of the Tennessee in August, and through the close of the second day of the battle on September 19. Photos and illustrations appear throughout (not in a separate photo section, which seems to be part of the Savas-Beatie MO, along with the footnotes) as do sufficient maps by David Friedrichs, who performed the same task in Powell’s earlier Maps of Chickamauga. With the passing of the anniversary of the Battle of Chickamauga, here’s my In Harm’s Way/Collateral Damage article on the Snodgrass Cabin, which ran in Civil War Times magazine in 2010. This is the article as submitted – some changes were made to the final product. The fighting between Union Major General William Rosecrans’s Army of the Cumberland and Confederate General Braxton Bragg’s Army of Tennessee reached a climax on the farm of George Washington Snodgrass and the series of hills known as Horseshoe Ridge on September 20th, 1863. While the story of how Union Major General George H. Thomas made his stand there and earned his nickname, The Rock of Chickamauga, is well known, that of the family of those displaced by the fighting is less so. G. W. Snodgrass left Virginia and came to Georgia prior to 1843. Sometime between 1848 and 1851, he moved from Chattanooga to Walker County, and the deed for his purchase of the farm from Sammuel Igon was recorded on September 8, 1855. The ground was far from prime farmland, dotted as it was with hills and ravines. The farm’s cabin was about a half mile from the north-south LaFayette Road, accessed by a farm lane running north from the east-west Vittetoe Road, and sat near the top of Snodgrass Hill which, while wooded, was open with good visibility. The log cabin was a “dogtrot” design, two structures connected by a covered breezeway. The compound also included a smokehouse, and was surrounded by a split-rail fence. A small peach orchard grew on the west side of the cabin. From the house site, a ridge spur runs north, into what was the Snodgrass cornfield. Other farm buildings on either side of the lane included a barn and servants’ quarters. A small family cemetery sat at the top of Snodgrass Hill. James T. Snodgrass, who died at seven months in 1861, was buried there. Using the 1860 census as a basis, G. W. Snodgrass was about 53 years old in September 1863, though some accounts say he was 60, and daughter Mary Jane recalled that he was 71 when he died in 1890, which would make him about 44 in at the time of the battle. Twice widowed, he lived on the farm with his third wife, Elizabeth, and seven children, ranging in age from four year old Martha Ellen to crippled, adult son John. Another son, Charles, had left to serve in the Confederate army. Years later Julia Kittie Snodgrass, who was six at the time of the battle, recalled hearing the sounds of fighting at Alexander’s Bridge on Friday, Sept. 18th. Her father stubbornly refused to leave his home that day, but as the bullets flew more thickly on the 19th – some even penetrating the cabin’s roof – Mr. Snodgrass determined it was time to leave. About 3:00 PM, the family headed northwest and camped in a wooded ravine. They stayed there for about eight days, and while they were without shelter and had little food, they didn’t lack company. Also taking refuge in the area were other area families, some of whose properties played prominent roles in the battle: Brothertons, Poes, Kellys, Brocks, McDonalds, and Mullises. As the fighting died down on Sunday, September 20th, the refugees heard the strains of a southern tune being played by a band, which they happily interpreted as confirmation of Confederate victory. Many of these families also had sons in the Confederate army, most notably in Company I, 2nd Battalion, 1st Confederate Regiment, which was part of Brigadier General John Jackson’s brigade of Major General Benjamin Cheatham’s Division in Lieutenant General Leonidas Polk’s Corps of the Army of Tennessee. This unit’s rolls included members of the Snodgrass, Brotherton, McDonald, Kelly, Brock and Dyer families, and the regiment’s major was James Clarke Gordon, who swore them into service in 1861 and was a son of the owner of the Gordon mansion at nearby Crawfish Springs. So, added to the hardships of lack of food resulting from two foraging armies, and homes destroyed or otherwise occupied by wounded soldiers prohibiting the return of their rightful owners was the uncertainty of the wellbeing of loved ones involved in the fighting. The Snodgrass cabin and outbuildings had been used to treat wounded, mostly Union soldiers, during and after the battle. When the family returned to their home eight days after the battle, they found it “a gory shambles”. While the wounded had been removed, most of the family’s possessions were gone, bloodstained, or in pieces. The damage was so extensive they were forced to relocate to a campsite near Ringgold, Georgia. They didn’t return to their farm until the war was over. Several accounts of the battle state that Charles Snodgrass died on or near his family’s homestead during the battle. However, Chickamauga historian and author David Powell’s research of Consolidated Service Records (CSR) indicates that Charles deserted in the summer of 1863 (one of at least four local men to take that route out of the unit), his name last appearing on the July/August roll. Union authorities took him into custody in Walker County and sent him to Louisville, and on December 28, 1863 he took an oath of allegiance to the Federal government. He was later released north of the Ohio River. While it’s not clear if he was present on the field during the battle, he almost certainly was not killed during it. All trace of the hilltop cemetery has disappeared. Thanks to Maps of Chickamauga author David Powell and Lee White of the National Parks Service for their assistance in the preparation of this article. 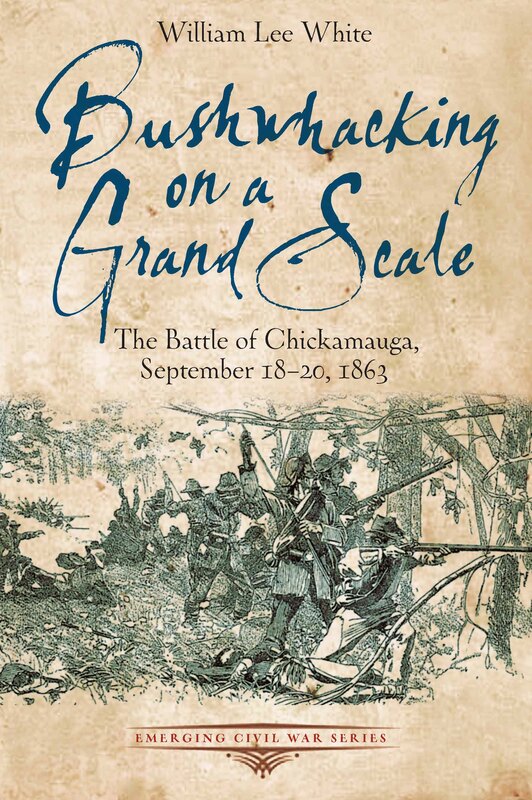 The most recent installment in Savas Beatie’s Emerging Civil War Series is Bushwhacking on a Grand Scale: The Battle of Chickamauga, September 18-20, 1863, by William Lee White. Lee is a NPS Ranger at Chickamauga and Chattanooga National Military Park and a longtime presence in the online Civil War community (I think I’ve been yaking at and with him for over ten years now), and he’s always been quick to share his extensive knowledge on the park, the battles, and the labyrinthine Confederate command structure in the Western Theater. With Bushwhacking, he offers a profusely illustrated, concise, and easy to follow narrative of the campaign in the style to which we’ve become accustomed in this series. Appendices include notes on Longstreet’s attack, Chickamauga in Memory, Civilians in the Battle (Lee and Dave Powell helped me out in this regard with my Civil War Times article on the Snodgrass cabin a few years back), and an Order of Battle. 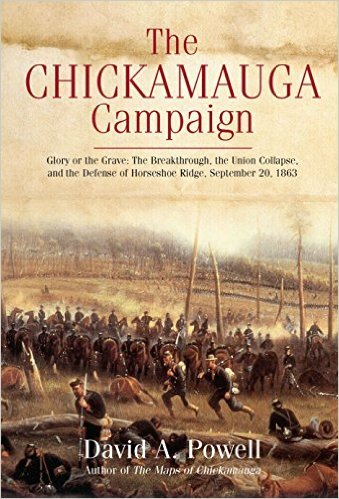 A nice touch is a recommended Chickamauga reading list. The paperback format makes this ideal for tossing in the backpack for a day of tromping the fields – once Congress and POTUS get their stuff together and open them up again.